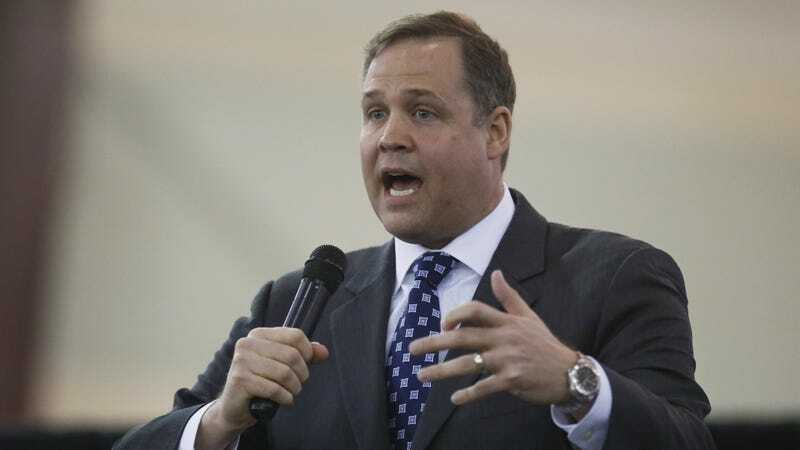 The White House’s effort to head every science-adjacent agency with science skeptics continued apace today, when the Senate held a confirmation hearing for Jim Bridenstine (R-OK), Trump’s pick to lead NASA. You’ll be shocked to learn that his views on climate change do not exactly comport with the overwhelming scientific consensus on the issue. NASA may be better known for its missions to Mars and Pluto, but the space agency’s mandate has always included studying the Earth. These days, its Earth science division, which is responsible for a suite of Earth-observing satellites, makes an outsized contribution to the global scientific community’s understanding of human-driven climate change. One would think that strenuous agreement with the scientific consensus—that climate change is real, and being driven by human activity—would be a basic qualification to head up an agency that carries so much responsibility when it comes to understanding the Earth. But this is 2017. Asked by Brian Schatz (D-HI) whether he agreed with the statement that “climate warming trends over the past century are extremely likely due to human activities,” Bridenstine said yes. It was a promising start! Schatz followed up by asking “to what extent” Bridenstine believes human activity is responsible for climate change. “That is a question I do not have an answer to,” the potential future head of NASA replied. “If that’s the scientific consensus,” Bridenstine responded uneasily, looking like he wished he could melt into the table. “You don’t know?” Schatz fired back, a note of incredulity seeping into his voice. He was, after all, questioning the potential future head of America’s leading Earth science agency. While not as egregiously wrong as the views embraced by EPA head Scott Pruitt—who questions whether CO2 is a greenhouse gas and might think smog is actually good for you—Bridenstine’s equivocal response reeks of the soft denial peddled by other member’s of Trump’s cabinet since day one and by the GOP for years. Sure, maybe this whole climate change thing is real, but how can we possibly be sure how much humans have to do with it? This isn’t the first time Bridenstine has betrayed views on climate that fall well outside the scientific consensus. He has previously voiced skepticism about global temperature datasets, even stating on the House floor in 2013 that the Earth hadn’t been getting warmer over the past decade. As Schatz was quick to remind Trump’s NASA pick today, scientists are quite sure that human activity is the dominant driver of the planetary warming we’ve seen since the start of the Industrial Revolution. But when he pressed Bridenstine to clearly state for the record whether he agreed or disagreed, the congressman wouldn’t do it. “It’s gonna depend on a whole lot of factors and we’re still learning more about it every day,” Bridenstine said, adding that in some years “sun cycles and other factors” may be more important than human activity. To be perfectly clear, the idea that sun cycles are responsible for modern global warming has been roundly debunked by scientists, although it remains a favorite talking point among the most stalwart deniers. Later, Tom Udall (D-NM) asked how Bridenstine would address those who refute NASA research on climate change. That, unfortunately, would not be the theme of the subsequent cross-examination by Senate Republicans, who used their floor time to bloviate outright science denial. NASA better hurry up with that Space Launch System. I’m not sure how much longer this planet is gonna be habitable.